The use of lights while hunting nocturnal animals is common practice and widespread. But exactly how luminaries are applied on the field can sometimes be confusing, due to conflicting tips among hunters in the community. For example, some individuals claim that green light is most effective for all types of animals, while others recommend using red light due to its ability to reduce spooking. Which Light Color Should I Use for Hunting Nocturnal Animals? When it comes to intensity, a handful of hunters suggest sticking to low light settings in order to decrease the possibility of scaring away the target. A quick search online on hunting forums reveal that location and the type of animal being hunted could affect this lighting technique. This article aims to provide relevant information and tips on the application of various light colors for nighttime hunting. Red light, with an average wavelength measurement of 630 nanometers, is a highly preferred color for hunting nocturnal creatures, like coyotes and wild hogs. The light, when it comes to distance, does not travel as far as other colors, including green – the second most used light color in hunting grounds. As a light for locating animals in far locations, red beams are not useful. But due to its subtle properties, creatures are less likely to get spooked by the beam. This is incredibly effective for creatures that are cautious and wary of the presence of humans in the outdoor environment. By creating less shadows, the animals are also less prone to fleeing their current position. Moreover, the subtleness of the light could prevent stirring up insects and bugs around the target, which could give away the presence of the beam. Taking these points into consideration, red light is most effective when hunting coyotes and some species of deer. Some hunters claim it is useful for other types of animals as well, mostly because red beams are so subtle. Individuals using night vision equipment may want to use red light over green or white light, due to the beam being less disruptive. If you’re unsure or have only recently started using hunting lights for this purpose, red would definitely be a great choice. 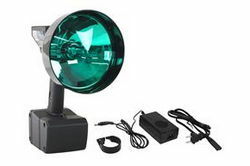 Green light consists of wavelengths measuring roughly 535 nanometers. Compared to red, this colored beam appears bolder and more distinct – even in low-light settings or when paired with another red light with the same number of lumens. Using a green light allows hunters to see around 20 percent further; but in reality, this doesn’t directly translate to a stronger light beam. Since humans can see green light better than red, the beam appears to be shining further into the field. This is the reason why most hunters (a whopping 60 percent) prefer using green light, even though human visibility isn’t the main driving factor in the application of hunting lights. In fact, the main objective is to ensure that critters don’t see the light. This type of light is mostly used to hunt wild hogs. It is crucial to clarify that this does not mean that green should be used exclusively on feral pigs. If you’re not successful in using green light and notice that your targets still get spooked by the beam, don’t worry. Success in using colored lights isn’t fully determined by the color. One must also apply the right techniques in manipulating the light and using it in a passive manner, which is covered in the next section of the article. Using a colored hunting luminary like a regular flashlight or mounted light will not generate consistent results on the field. This is because light intensity must also be taken into consideration when using this technique. To prevent spooking, low light intensity levels should be applied on the field. This could reduce the possibility of disturbing the surroundings of the target animal, which could give away one’s presence and intentions. The practice of sticking to low intensity lighting is applicable to all hunting light colors – from red to green. With this in mind, it is important to find a hunting light that supports multiple intensity settings for taking down targets at various distances. These days, most hunting light manufacturers are going on the extreme end of intensity settings, usually aiming for the brightest possible setting. Finding one with 3-4 different low light settings could help you use this technique to your advantage, as most hunters will likely be using high intensity lighting.